Cast and Crew: Wilson Yip (director), Donnie Yen, Louis Koo, Ray Lui. What It’s About: Inspector Ma (Donnie Yen) of the Hong Kong Police stands accused of excessive force during his investigation into a Vietnamese gang. But when his long-time informant is put at risk, Ma brushes aside standard operating procedure to unleash his unconventional, no-holds-barred fighting style against the ruthless criminals. Why Watch it Today: Martial arts superstar Donnie Yen is a Boston product, first studying wushu with renown Chinatown teacher Bo-sing Mark. Since then he has summited the mountain of kung fu fame by portraying wing chun master Ip Man. But he’s also a freethinker in the footsteps of Ip Man’s onetime student Bruce Lee, stating openingly he prefers brazilian jiu-jitsu to kung fu. He is also fresh and invigorating in this slick-paced police-action romp. 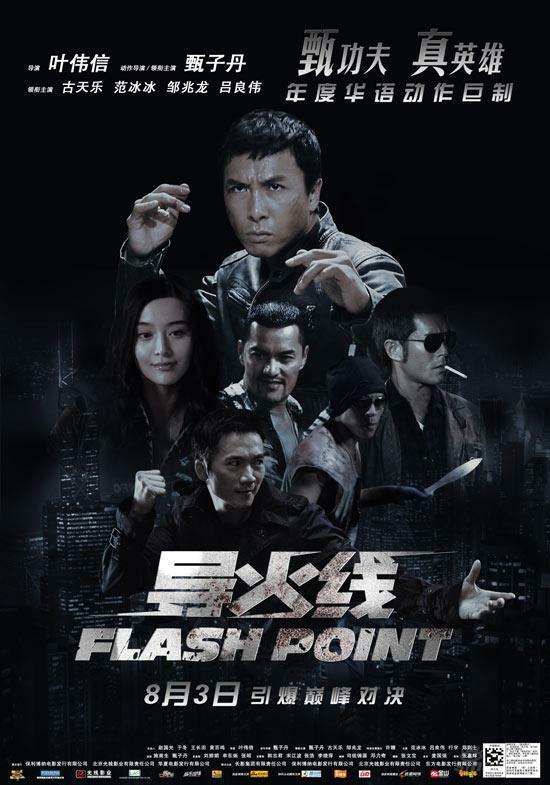 Flash Point injects a dose of MMA-themed mayhem into its Hong Kong stunt choreography–flying armbars, ground-‘n-pound, and judo throws meld comfortably with sidekicks, roundhouses, and kung fu haymakers. It’s really a ton of bang for the buck and an underrated gem, and if you’re not a Donnie Yen fan yet, this movie will make you one. Flash Point is set during the lead-up to this day in 1997, when the British handed Hong Kong back to China after a 99-year “lease”. The MMA fusion theme fits like a glove, as Donnie Yen presents an appealing marriage between old and new, east and west. This entry was posted in Action, Martial Arts, Movie of the Day and tagged BJJ, cops, Donnie Yen, gangs, Hong Kong, Judo, kung fu, MMA. Sounds like something I should check out. As an aside, I always forget that Donnie Yen is from Boston, despite having the most Boston sounding first name possible. I mean, is there any other place where someone named Donald becomes Donnie, or an adult man goes by Timmy (friend’s uncle is Uncle Timmy…personally I wouldn’t stand for that)! Donnie Wahlberg and Donnie Yen should team up to make “Combat Zone”, the definitive movie of the mean streets of Boston, circa 1983. Shall we get cracking on the script? I’m game but be aware that Donnie was already in a terrible DTV crime movie called Southie whose tag line was “THE MOST DANGEROUS NEIGHBORHOOD IN AMERICA”, which seemed like a very Boston bit of exaggeration. Regardless, this is a project I would love to watch, and the Combat Zone setting would be perfect.